Last Sunday my knight nobly saddled up the Mustang and drove me almost three hours to the Maryland Faerie Festival in Upper Marlboro. For once, the weather behaved for me. The first time we made the journey, back in 2008, there was such a heat wave that several of the vendors got sick and went home early. Then last year it was pouring when we awoke, so I reluctantly stayed home and danced around the house in my fairy splendor instead. This year it was sprinkling in the morning, but the sun was bright and shining by the time we arrived. We stopped for lunch at La Fontana and devoured a sinfully delicious Sicilian-style pizza. That took a little longer than expected, but we flew in just in time to see most of the Faerie Fashion Show on the Honeysuckle Stage, which is where most of the photos in my collage are from. Unfortunately, being fashionably late meant I missed the Faerie Lore in Other Cultures talk by Featured Guest Artist Giovanna Adams. I did get to say hi to her at her booth later, though, and she is as sweet as ever. I was also giddily surprised to see that fellow Fantasy Artist of Etsy Becky of Up From the Ashes had a booth. The last time I saw her and her absolutely amazing adornments for modern faerie tale creatures in person was FaerieCon 2008. That's us smiling pretty in the bottom left of the collage. I'm the one that forgot to remove my sunglasses. We also stumbled upon the last half of an acrobatic variety show by Professional Showoffs, Exentrik. Nickolas and Jeffrey are quite the amusing duo. That's them balancing and juggling on the right edge of the collage. After exploring all the vendors' treasure and ogling many a sparkling trinket, I was hypnotized by the belly dance moves of Troupe "Hip"notic on the way out. They put on an absolutely fabulous show. If I lived closer, I'd be tempted to try to join their group. Not that I can dance as magnificently as them or promise I wouldn't cheetah sprint from the first stage surrounded by people, but a beginner can dream! Sounds like so much fun! Lovely collage, too. Wonderful photos! And ooo a unicorn!!!! Oh, I wish we had gotten to meet! Leah and I are part of FAE as well, if a bit inactive, as we are SO active in other things. Glad you enjoyed the festival. We too enjoyed Giovanna, and I got to meet and talk with Becky of Up From the Ashes. Maybe we will meet at another show! Thank you for all the compliments on the collage, darlings. 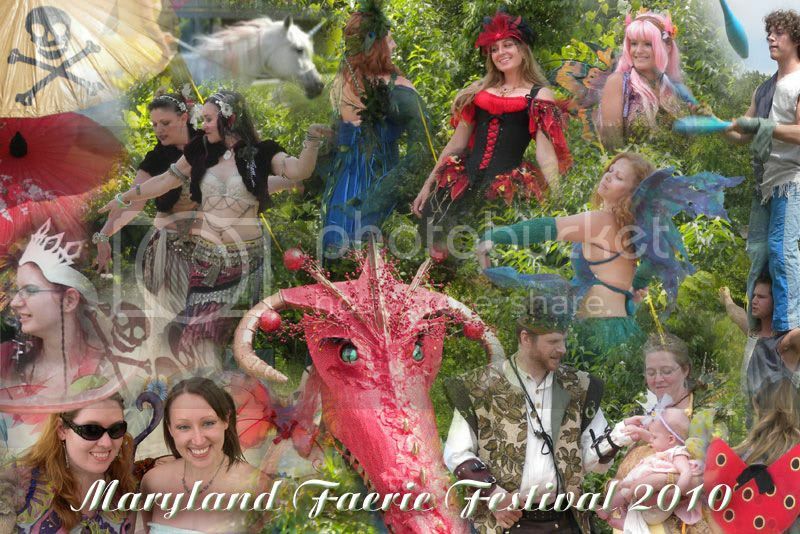 I try to make one for every faerie event I attend.